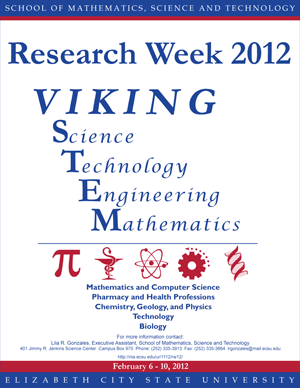 The School of Mathematics, Science and Technology (MST) welcomes all of the honored guests and participants to the 8th Annual Research Week 2012. 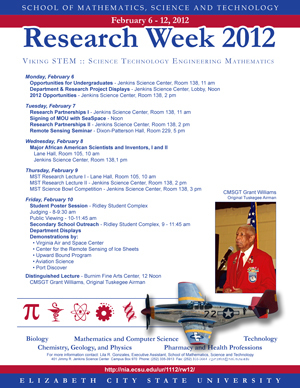 This week will enable the Elizabeth City State University family, the citizens of Elizabeth City, and surrounding counties to participate in informative presentations by student researchers and their mentors, workshops and seminars featuring government officials, and private industry representatives. There also will be outstanding demonstrations from departments within the School of Mathematics, Science and Technology and from scientific organizations. 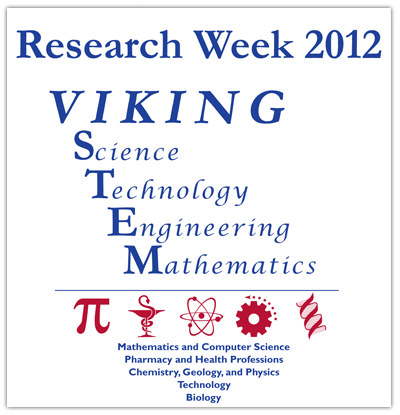 This year's theme is Viking STEM (Science Technology, Engineering and Mathematics). As the School of MST keeps in line with one of President Obama's initiatives, "Educate to Innovate" where one of the objectives is to inspire student's appreciation and excitement for STEM education. The participants in Research Week 2012 have demonstrated the reality of this initiative and we invite you to visit as many presentations, lectures and demonstrations as possible during this week. I would like to acknowledge all those individuals involved, for the coordination of Research Week 2012 as it is not an easy task. I extend special thanks to all guest for taking time out of their busy schedules to participate in this event as well as the Research Week Committee, faculty, staff, and the office of Academic Affairs. I would also like to thank all of our presenters for sacrificing time out of their busy schedules to participate in this event.